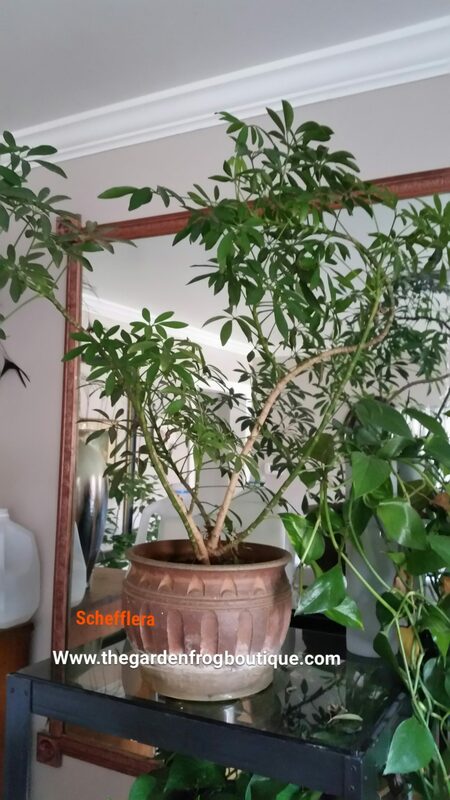 I have 3 Schefflera plants that were from my dad’s funeral in 1999. Now from the pictures you can see they are wild crazy looking plants that appear to be a bit leggy. Truth be told that is from a lack of sunlight and pruning. I have an emotional attachment to my plants and so I have let them be for years growing in whatever direction they desire. 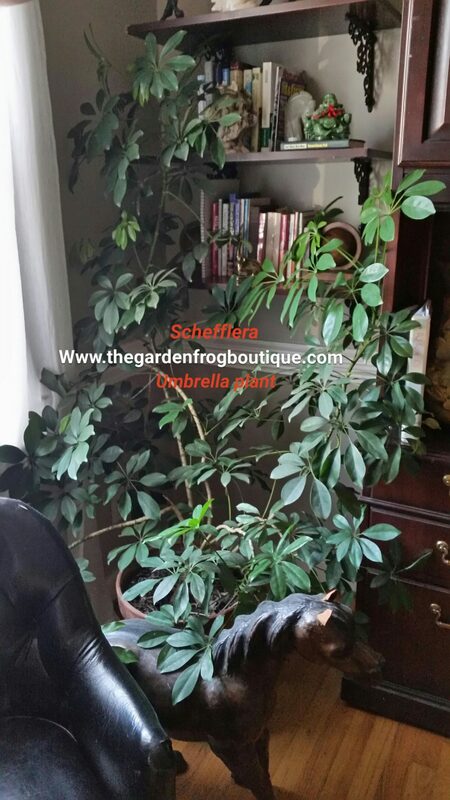 The Schefflera will tolerate low light but it really wants a bright indirect light such as being opposite south or west facing windows in a room. 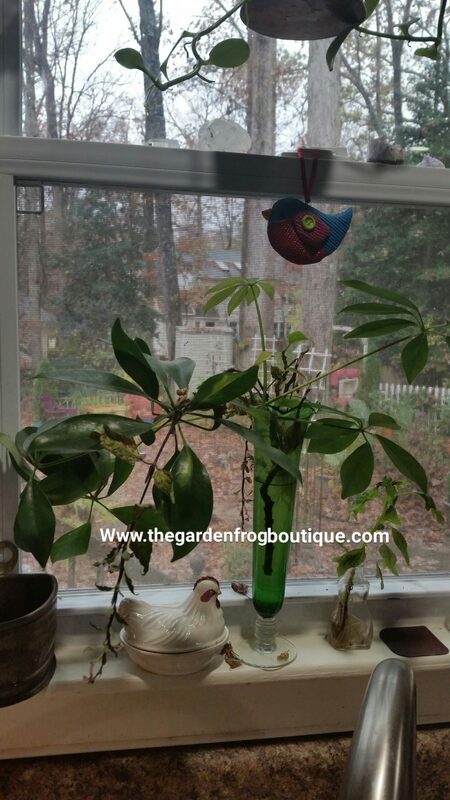 If you do not have a bright room, place in front of an east facing window or purchase a grow light and spotlight your Schefflera between 8-12 hours a day (I would mimic the season so longer light in summer and shorter in winter). 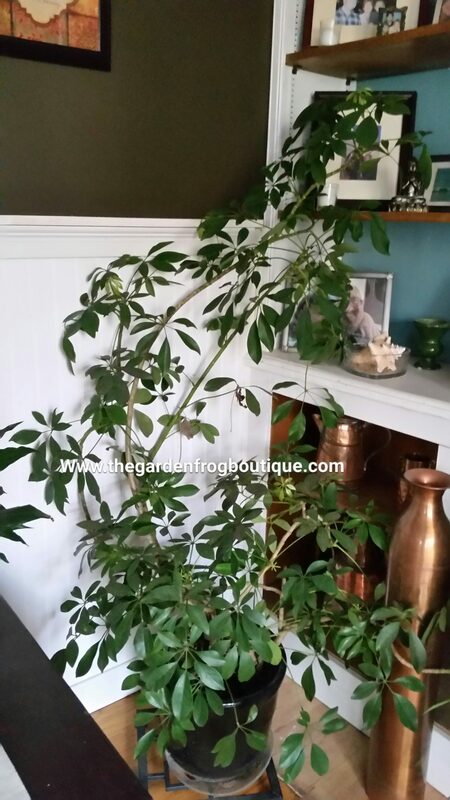 In the summer, the Schefflera loves the heat and humidity and seems to really grow and flourish. If you can set up an area in your shade garden, the plant will thrive and grow. No full sun but bright indirect light under the canopy of trees or a gazebo where the sun is filtered. 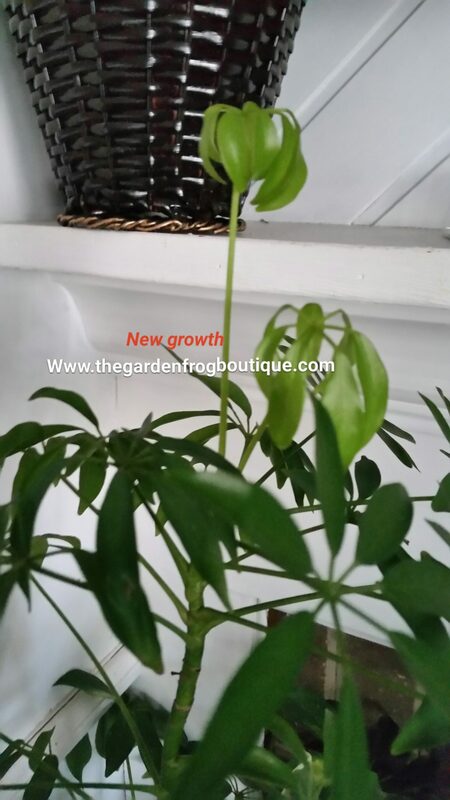 I have rooted the Schefflera by cutting too and want to advise that it takes some patience. I rooted one stem in water and it took about 2 months for roots to appear. 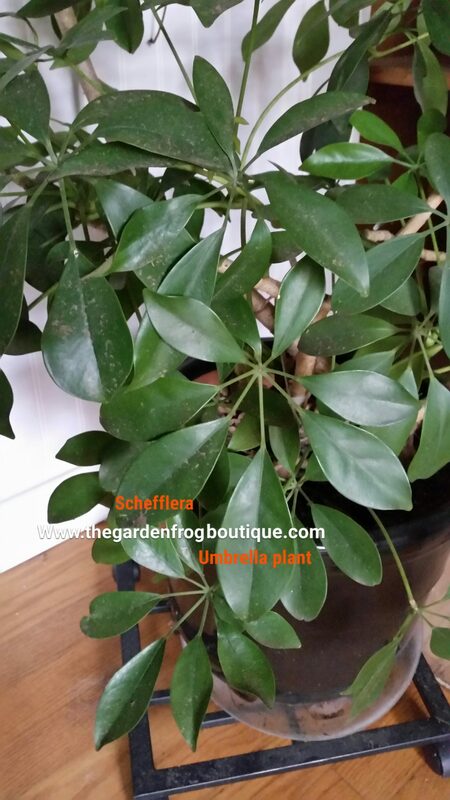 The Schefflera is a fairly common plant found in floral, grocer, and retail stores. It can survive temps down to 50 at night. My house is 65 during the winter months and the Schefflera loses a few leaves but nothing I fret over. 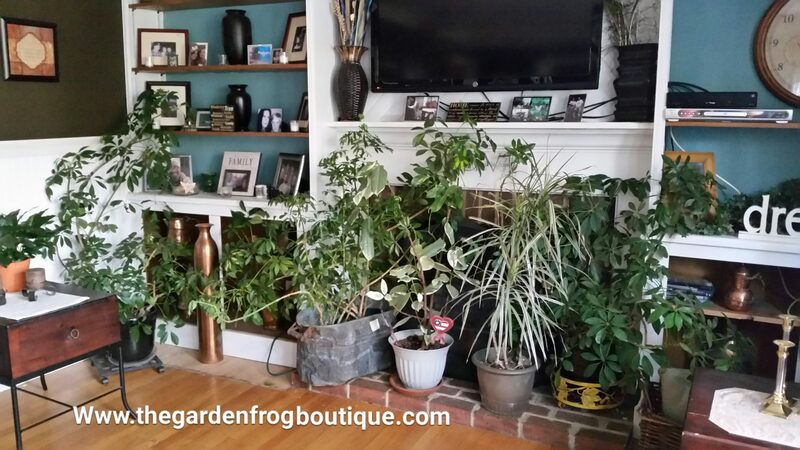 Losing some leaves is expected when bringing the plant indoors or home from the store. When leaves turn yellow at a rapid rate and fall off, then worry. When this happens check for pests and soggy soil. If it is soggy soil, then let the plant dry out and water only once a week after that. If you have a place, you may want to check the roots by pulling the plant out of the pot and check to see if the roots are rotting (which healthy roots are usually white and flexible not brown and mushy). If so, then you may want to try and cut off rotting roots, clean the pot, and repot in fresh soil. If you have room I would try and root a stem in water in a small vase. I hope I have given you the knowledge to grow one of these green beauties. Thank you for stopping by!